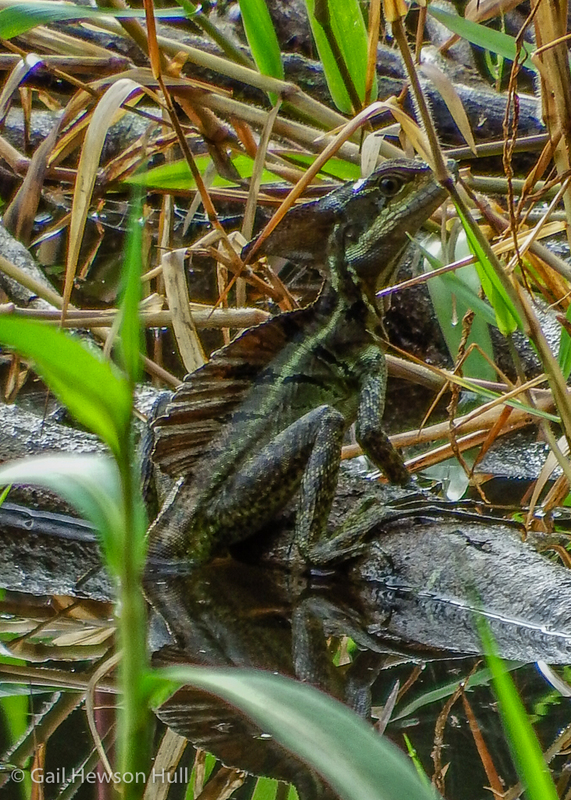 The ability to run bipedally across water at a speedy clip anoints the Common Basilisk (Basiliscus basiliscus) with this special “Jesus Christ” moniker and makes it probably Costa Rica’s most famous lizard. The hind feet are equipped with adaptive flaps of skin that line the toes, allowing juveniles to skip across up to 20 meters of open water. (See National Geographic video below.) Larger, heavier males have the energy to run only a few meters; and if necessary, all Common Basilisks can resort to swimming and do it well. They apparently avoid swimming unnecessarily to avoid aquatic predators. 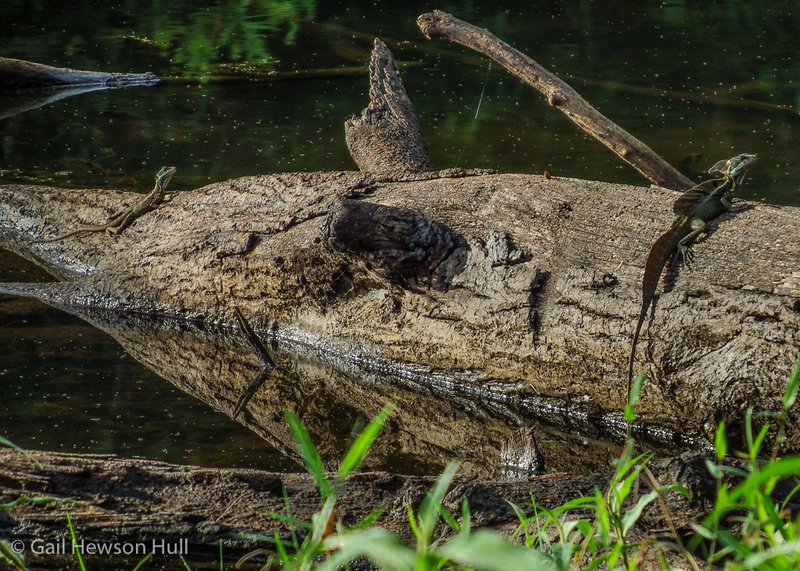 When I walk on our lakeside trail at Finca Cantaros, loud splashing sometimes startles me as the big male races to deep grass cover from his sun-basking post on a fallen tree branch or trunk protruding from the water. The male, reaching almost one meter in length, has a large head crest and sail-finned back resembling a miniature dinosaur. The female, with just a small head crest, is about half that size. Diurnal and omnivorous, basilisks eat invertebrates such as insects, scorpions, and fresh water shrimp; also vertebrates such as other lizards, small snakes, fish, mammals and birds; they even eat fruit and flowers. 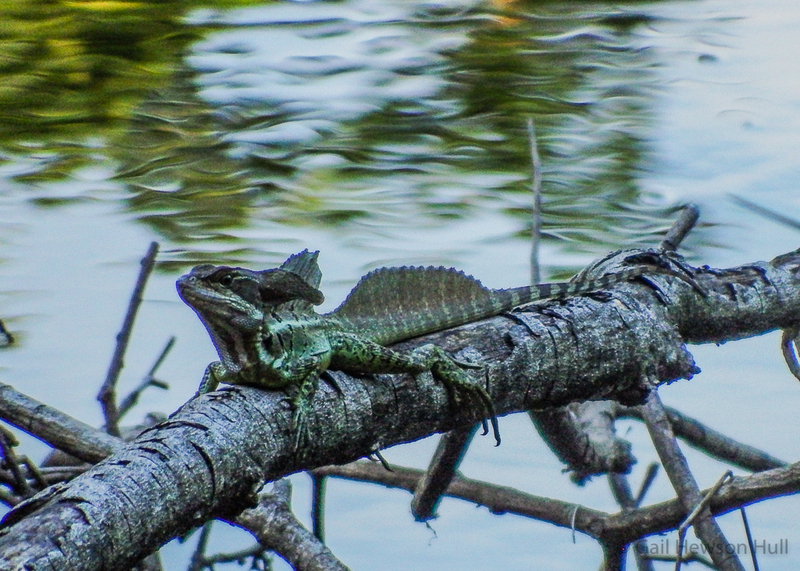 (The Common Basilisks at Finca Cantaros hang out near a productive fig tree by the lake). Raptors, snakes and opossums are their predators. At about 1200 m elevation, we are 200 to 600 m higher than Common Basilisks are predominantly thought to reside*. Is climate change pushing them up the slope? Apparently we should get ready for more lizards, as in perfect circumstances, the Common Basilisk can populate an area at astounding density: two- to four-hundred lizards per hectare! So far–and these sightings are recent–we’ve seen only two at any one time. Since the two on the log in the photo above are a male and female, we certainly hope the conditions here are much less than ideal. May the populations of raptors, snakes, opossums and future generations of Basiliscus basiliscus be well balanced, for their sakes and ours. *R.W. Van Devender, Basiliscus basilicus, Costa Rican Natural History, p. 379-380, edited by Dan Janzen, University of Chicago Press, 1983, served as a fine reference to learn about the Common Basilisk. See also Twan Leenders, A Guide to Amphibians and Reptiles of Costa Rica, p. 168-169, a Zona Tropical Publication, 2001, another fine guide.